Awards junkies everywhere foam at the mouth for the EGOT: when artists manage to win an Emmy, Oscar, Grammy and Tony Award. 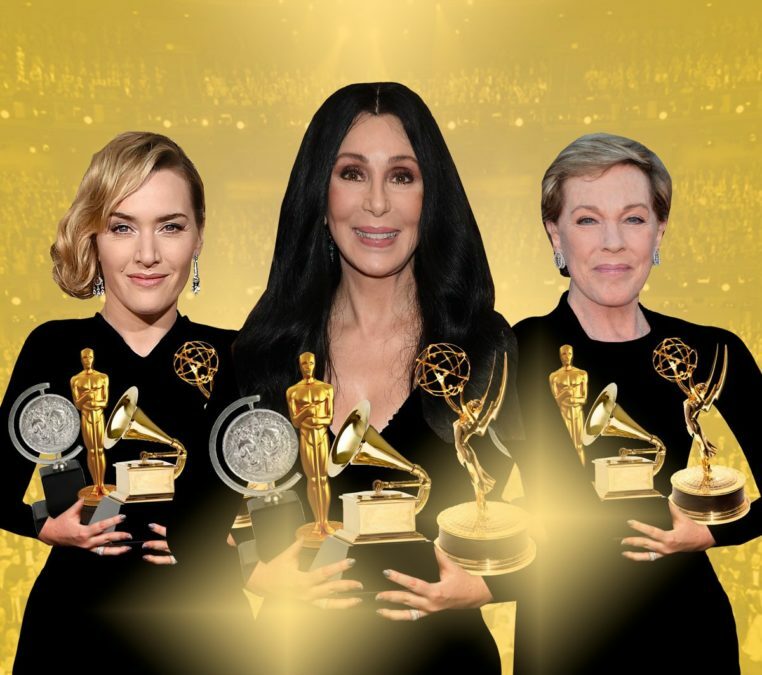 Racking up all four major American entertainment awards (in competitve categories) is a feat accomplished by only 12 people in the world, including Whoopi Goldberg, Rita Moreno, Audrey Hepburn and Marvin Hamlisch. In February, Frozen composer Robert Lopez became the first person ever to double-EGOT, winning all four awards twice. In honor of the 72nd Tony Awards on June 10, we're taking stock of the stars and creatives who only need a Tony to round out their quadruple crowns. It's been 30 years since Cher won the Best Actress Oscar for her starring role in Moonstruck (beating Meryl Streep, of all people). She earned the 1999 Grammy Award for Best Dance Recording for her chart-topping hit "Believe," the song that brought auto-tune into the 21st century. With an Emmy under her belt for the music special Cher: The Farewell Tour, all the legend needs is a Tony Award. It's too bad she's not the star of The Cher Show, which would make her eligible next season. Though his movies (including The Aviator, Hugo and Raging Bull) have won Oscars, it was his 2007 blockbuster The Departed that won him his first Best Acheivement in Directing Academy Award. Scorcese has three Emmys, one for Boardwalk Empire and two for his TV special on George Harrison. The Hollywood producer's talents also won a Grammy for Best Music Film, after he directed the 2005 Bob Dylan documentary No Direction Home. Scorsese's only brush with Broadway, helming the 1977 Kander & Ebb Liza Minnelli vehicle The Act, raked in seven Tony noms and a win for Minnelli but nothing for the director. In 1996, Andrews famously rejected her Tony nomination for her starring role in Victor/Victoria after the entire rest of her company was snubbed by nominators. According to The New York Times, she addressed the snub to a matinee audience days later saying, "I have searched my conscience and my heart and find that I cannot accept this nomination, and prefer instead to stand with the egregiously overlooked…" She did garner two earlier nominations (for Camelot and My Fair Lady). She earned two Emmys, as well as the 1965 Oscar for leading the classic Disney movie Mary Poppins. With an Oscar for 2008's The Reader, an Emmy for Mildred Pierce in 2011, and a Grammy for a children's spoken word album, Winslet has one of each award except the prestigious theater one. Winslet has never been on the Great White Way, but she has eyed a Broadway debut before and also knows how close she is to EGOT-ing. Hey, we hear Titanic might be coming back. The man behind the heartstring-plucking music of Pixar won an Oscar for the 2009 animated movie Up, as well as an Emmy for scoring the pilot episode of Lost. With a Grammy for the soundtrack of another Pixar hit, Ratatouille, all the composer needs is a Tony to complete his EGOT. With Disney's track record of bringing animated films to life on Broadway, could one of Giacchino's scores be the first Pixar adpatation on the Great White Way? The former child star turned director has nabbed an Oscar for his 2001 movie A Beautiful Mind, as well as two Emmys, one for Executive producing Arrested Development (for which he also serves as the narrator) and one for the mini-series From the Earth to the Moon. Howard also has a Grammy win for Best Music Film for The Beatles: Eight Days a Week – The Touring Years. Maybe the musical stage adaptation of Howard's 1989 movie Night Shift, in the works at Warner Brothers, could get him a Tony? This multi-hyphenate artist (and The Wiz! Live star) has earned three Grammys for his music career, but he's also lent his songwriting skills to movies and television. His songs "Glory," co-written with John Legend for the movie Selma, and "Letter to the Free" for the Ana Duvernay prison documentary 13th, won an Academy Award and an Emmy, respectively. Common appeared in a reading of Howard Sackler’s 1967 play The Great White Hope in 2014, but he has yet to take his shot at a Tony on Broadway. Scoring and arranging the music for the film version of West Side Story earned Ramin both an Oscar and a Grammy in 1962, and composing music for the daytime drama All My Children got him his Emmy. In his heyday orchestrating Broadway musicals such as A Funny Thing Happened on the Way to the Forum and Wonderful Town, there was no Tony category for Best Orchestrations, but the 99-year-old might still be able to win if they revive Gypsy for the fifth time. Here's another music man whose award count was significantly bumped up by Pixar. In addition two three Emmys, Randy Newman has two Oscars (for Toy Story 3 and Monsters Inc.) and a whopping seven Grammys, five for scoring Pixar films. Newman's songbook has been adapted into stage revues numerous times (including one entitled Maybe I'm Doing It Wrong) but never on Broadway. He's the man that put the dun-dun-da-dun in Darth Vader's walk! The famous movie composer is best known for scoring the Star Wars franchise, which won him one of his five Oscars, but he also won for Jaws, Schindler's List, Fiddler on the Roof and E.T. He also won a whopping 24 Grammys and three Emmy Awards, but no Tonys yet. And E.T. on Broadway is about as unlikely as King Kong on Broadway—Oh, wait. The pop singer-songwriter is a six-time Grammy winner, has one Emmy Award and three Academy Awards, two of which for scoring Butch Cassidy and the Sundance Kid. Bacharach has only been nominated for a Tony Award once, for composing the score of Promises, Promises. There was also a musical revue of his work called The Look of Love on Broadway in 2003. What the world needs now is Bacharach, back on Broadway. Put your pitchforks down! Douse your torches! We know Babs was given a special Tony in 1970, but according to the totally unofficial EGOT National Committee Rulings, she needs to win one in a competitive category. Of course, Streisand has eight Grammys, five Emmys and two Academy Awards (one for her iconic role in Funny Girl and one for "Evergreen" from A Star Is Born). This is honestly just a ploy to get her to do Mame.